While a car has several maintenance needs and requires constant care, the most crucial area of your vehicle is the engine. An engine that is in trouble will make a car inoperable and can cost a lot of money to repair. Which is why avoiding engine problems and catching any trouble in the engine before it escalates is important. Today we want to discuss how oil checks and synthetic oil changes can help you keep your engine in great conditions. Even though lubrication is the number one job of motor oil, just having enough oil in your engine is not enough, the quality and type of oil you use also makes an impact. No other motor oil compares to the incredible full protection and complete advantages that Amsoil full synthetic oil provides. Start providing the best for your engine today, and watch your engine thank you with improved performance and savings. Reduce engine problems today, visit our Amsoil online shop or contact us here and buy the right products for your engine, today. It is best to check the oil at least once every two or four weeks, depending on the use, and type of driving conditions your vehicle faces. When you check the oil there are basically two main things you are looking for. One is the level of the oil, there must be enough oil in the oil pan to complete the job correctly without forcing the engine to work excessively due to lack of lubrication. The second thing you need to look at is the condition of the oil itself. The appearance and feel of the oil can let you know if the oil has run-down its properties. Very low levels of oil should be taken care of immediately as this is one of the most dangerous things for the engine and can lead to a complete breakdown. When checking the oil, it is normal that the oil level lowers a bit, especially if you check it once every month or longer, however very low levels of oil in a short period of time require attention and possibly even professional diagnostic. Engines that use conventional oil tend to need more oil added more often but even then it is not ok for the oil to be used up abundantly and very quickly. Other factors such as driving habits and conditions also play a role but the decrease of the oil should not be dramatic if it is there may be another problem going on inside the engine. Frequently the reason for oil being used up so fast is leaks, but it could also be caused by an internal problem that may make the engine work harder and use up more oil faster. If you start noticing these problems make sure you take your vehicle to a professional before the problem intensifies. 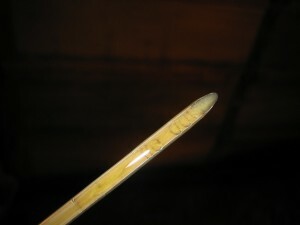 After you have completed and oil check and have established the oil level, use the oil dipstick to pick up some oil and place it between your fingers. Run your fingers lightly against one another and see if the oil feels grimy or if it leaves a blot of dirt on your fingers. If the oil does this, it may mean it needs to be changed soon. Also, take notice of the color. An oil that is still in good shape should keep a light transparency even if it is has a darkish color. When the oil is yellowish or even brownish and a bit clear still, and also does not leave dark smudges on your fingers, then it may still be able to last a bit more before a change is absolutely necessary. However, if it is dark and not very translucid and leaves a trace of dirt in you hand it should be changed as soon as possible. Your engine deserves the best protection and most integrated coverage against friction and other harmful effects, use Amsoil full synthetic oil for all your oil changes, and you will definately notice the positive difference of its many benefits. At Power Sports Oil we carry all the best items and highest quality full synthetic oil, call us now at (510) 351-8500 and order yours today.